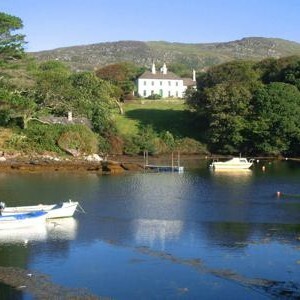 Westcove Lettings consist of four period properties at Westcove – an area 1 mile west of Castlecove, 3 miles east of Caherdaniel and overlooking the beautiful Kenmare Estuary. Just off the famous ‘Ring of Kerry’, one of the most scenic drives in Ireland and one hour south of Killarney, with its magnificent lakes Westcove Lettings are ideally located for a holiday in beautiful Co Kerry. 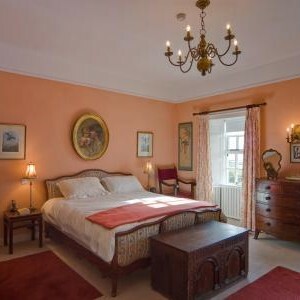 An attractive, early Georgian country house sleeping eight (plus two) comfortably – two doubles, two twins and two adjoining single bedrooms and five bath/shower rooms. The terrace to the front of the house is stone-clad and overlooks the harbour and Kenmare Estuary. It has a built-in barbecue and comfortable outside furniture. A rowing boat is available at tenant’s own risk. The huge Games Room, in the Stables, is very well equipped with table tennis and other games. It also converts well into a small meeting room. Irish live music/dancing evenings can be arranged in here for special celebrations. Adjoining this is a large, well lit studio, suitable for art groups. These facilities are also approachable from the outside and are shared with The Stables by mutual agreement when they are let separately. Daily cleaning is included in the rental, but cooking, food shopping and extra house keeping will be tailored to individual requirements. We will provide options on request and will be happy to discuss these with our guests. Options and costs for the above will be sent on request and the final account for any ‘extras’ will be payable before departure by Mastercard/Visa or cash. 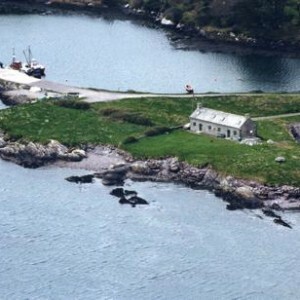 An attractive, grey stone building, originally stables and outhouses for Westcove House, “The Stables” was converted in the 1960s and the accommodation was totally refurbished to a very high standard in 2007. All upstairs bedrooms have a good sea view. It sleeps up to eleven people and provides an ideal annexe to Westcove House, particularly useful for extended family re-unions, being very suitable for children. 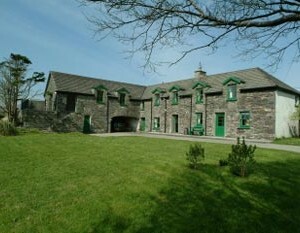 Normally rented with Westcove House, The Stables is also available for renting on its own. We have recently completed the renovation of a traditional 18th century stone cottage – probably originally built as a dwelling for farm workers and ‘wasted’ as a workshop/woodstore since the early 20th century. It now consists of a spacious living room with kitchen, dining area, a wood burning stove and large patio doors, opening south, to a stone terrace and magnificent views over the Kenmare estuary. Off the entrance hall there is a twin/zip’n link double bedroom, a single bedroom and a shower room (adjacent to both) also a utility room with sink, washing machine and tumble drier. The stairs lead up to a twin bedroom with its own shower room – both are small but comfortable and full of character. The ground floor has attractive ceramic tiles and underfloor heating throughout. We anticipate that Garden Cottage will be a popular alternative to The Stables as an annex to The House when parties number between 10 and 14 or when there are more singles required – golfers etc. 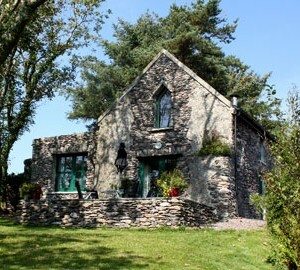 It also makes an ideal winter retreat with the stunning views over the Kenmare Estuary. Start/finish dates are flexible but it can usually only be rented on its own when less than one month’s notice given. A pair of old stone coastguard cottages renovated to a high standard in a unique setting 25 yards from their own shingle beach with breathtaking views over the lovely Kenmare estuary off the southern tip of the beautiful “Ring of Kerry” in south-west Ireland. 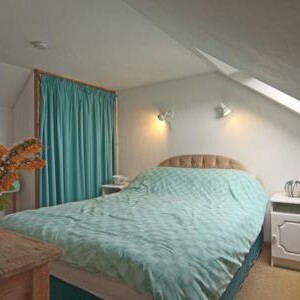 Pier Cottage can be rented throughout the year as two separate units, East End sleeps 2-4 and West End up to 7, or one inter-connecting cottage, with flexible accommodation sleeping up to eleven. Ideal for a holiday with a boat! Catering options for Westcove House/Stables are available – please check with property owners for details. 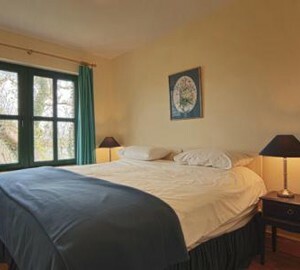 Short breaks (up to 3 nights) are sometimes available, especially in mid and low seasons, for half the weekly rate, but not usually bookable more than 4 weeks in advance. Please note: Easter, Christmas and New Year periods are generally only available for a minimum of 1 week. Lettings are ideally weekly from Thursday to Thursday (for Westcove House & The Stables), but can be flexible by arrangement, and run from 4:00pm on the day of arrival until 10:00am on departure day unless otherwise agreed. 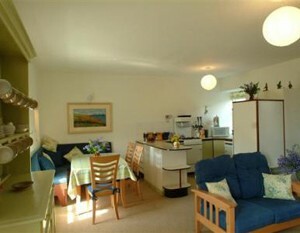 Lettings for Pier Cottage run Saturday to Saturday. Take the N22 Killarney Road, follow it until about 10 miles short of Killarney, where you turn left to Kenmare. In Kenmare (a good place to stop for provisions is Supervalu Supermarket), follow the signs to Waterville. Ten miles after going through Sneem, you reach the small village of Castlecove. All three properties are 1 mile past Castlecove on the left.